As the Athens-based band approaches its 25th anniversary, it has a core group of devoted fans, a solid work ethic and a successful marketing plan. 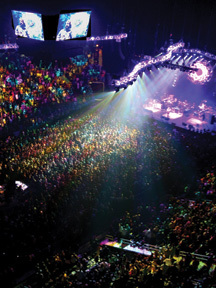 Auld Lang Syne: A crowd of ‘Spreadheads’ rings in the New Year with Widespread Panic in Philips Arena last December. Bill Cochran was talking about Widespread Panic’s grip on his soul, and he kept coming back to the word energy. “The reason I go everywhere I can to see these guys is the energy they provide. They give me something I can’t get anywhere else,” says Cochran, an entrepreneur and poet who lives on St. Simons and has seen every Panic show I’ve seen, and another 200 besides. I can feel it in the “energy room” at Cedar Heights, a holistic wellness center in Clarkesville, where John Bell, Panic’s lead singer and guitarist, discusses the business of being Widespread Panic, golf, improvisation and the music industry while our cells graze in the room’s detoxifying bio-regenerative energy field. And I can feel it a week later at the House of Blues in Myrtle Beach, where Panic plays three late-March shows to begin its 2010 spring tour. Cochran arrives just before Friday’s show, a last-minute decision to drive up the coast to meet friends and enjoy music. But it’s obvious there is no other place in the world he should be right now. “I’ve watched this band since they started,” says Cochran, who has seen Panic all over the country, on both coasts, and can claim that he – along with many other itinerant fans from the early days – is responsible for pushing forward Widespread Panic’s grass-roots, only somewhat accidental marketing plan. It’s a long-range “plan” that has taken Panic from fraternity parties in Athens to sold-out venues around the world to induction in the Georgia Music Hall of Fame (in 2008). As the band approaches its 25th anniversary in 2011, business continues to grow. They’ve just released their 11th studio album (Dirty Side Down, recorded at John Keane Studios in Athens). Most years, Panic is ranked among the Pollstar Top 50 grossing tours (some estimates put their annual touring gross at $20 million). A road-hardened group, Widespread Panic has flown beneath most of the usual radars – never cracked the Billboard Top 100, doesn’t receive much radio play, hasn’t produced videos for MTV or VH1. But they have sold three million albums (that doesn’t include the more than two million Internet downloads of live recordings that typically become available – for money – the day after a show). They’ve built their following in person, and their devout fans (called “Spreadheads”) – neo-hippies and frat boys, white-collar professionals and rednecks – catch up with the band when, where and as often as they can. Surrounding us on the balcony at the House of Blues are a residential real estate developer and his wife (from Alabama), a caterer (Metro Atlanta), a mortgage specialist (North Carolina), and Phil from New Jersey. Middle-aged, pretty moms dance in front of us, and one is either playing air guitar or pretending to reel in a fish. We haven’t met anyone who is actually from Myrtle Beach. Like the band, the Spreadheads are well traveled. Garrie Vereen, Panic’s equipment manager, has seen Panic about 2,000 times. He’s been with them since before they were a band, for the past 20 years as a full-time employee. Like the Grateful Dead before them, Panic developed its calluses and fan base through relentless touring and a swashbuckling improvisational approach im-bued with multiple dimensions of sound and style – rock, jazz, country, blues. Panic is at the forefront of the “jam-band” genre, though the six artists in the band don’t aspire to the limitations of a label. “Labels are for people who don’t bother listening,” bassist Dave Schools says. Bell says the jam-band label bothers him. Panic doesn’t stumble on stage. Instead, the musicians engage in a fluid musical conversation, telling jokes with riffs and glances, connecting through sonic threads with an audience that seems to know all the words. Lead guitarist Jimmy Herring, weaned on jazz and the free-style ton-ality of Col. Bruce Hampton, plays faster than thought or instinct. Percus-sionist Domingo “Sunny” Ortiz is pounding furiously, flicking gently, adding a tangible Latin texture to Nance’s staccato machine-gun drumming. Schools, a large man with long hair and agile hands, plays bass like a lead guitarist while keyboardist John “JoJo” Hermann’s flying fingers take you from New Orleans boogie to classical and most places in between. And Bell, whose dynamic vocals can sound like the devil on your shoulder or a compassionate bard with a breaking heart, is at the center of it all, up front. “We’re six guys listening to each other from the other five directions, actually six directions because you’re listening to yourself, seven if you’re listening to the audience. Go on and add the universe,” says Bell, whose wife Laura is a counselor and the boss at Cedar Heights, which the couple opened in 2008 in a green-renovated 1914 house. Meanwhile, something else is happening on the road and behind-the-scenes that makes the band’s music inevitable, like currents and tides. Steve Lopez sat in his car at a drawbridge in his hometown of Portland, Ore., on his way to a concert, listening to a story on the radio about the Colorado Avalanche winning the Stanley Cup. He eventually became the band’s manager. Ten years ago Lopez joined Wide-spread Panic’s crew and started climbing the corporate ladder – the band incorporated in 1987 under Brown Cat Inc. (whose offices are located in a renovated Athens warehouse). Yeager is a large man, bald with a goatee and a great disposition despite having once been run over by a car. “As long as I recognize you, you’re golden,” he says. Lopez gave a tour of the band’s “bus” (from Roberts Brothers Coach Company in Springfield, Tenn.). There are man-sized bunks with overhead DVD players with iPod plug-ins, a kitchen/den area with a big-screen TV (the crew was watching Rocky before Friday night’s show), and a lounge area with couches (and another TV) in the back. As he showed me the reclining feature on the shotgun seat, Lopez recalled a dearly departed favorite driver named Yogi, and a time when everyone had to get from Middle-of-Nowhere, Minne-sota, to Chicago for a gig the next day. Nance remembers well the days when he shared the driving and the band’s fleet included John Bell’s car and an eight-person Econoline. More stuff – the buses, semis and equipment – is one reminder of how the business of Widespread Panic has grown and evolved. There are others. The salaries were another early reminder that the artists were open for business. “We’d incorporated, and we were making something like $68.44 each per week,” Bell says. “Then we got our first raise, up to something like $87, and it was like, ‘Well, business must be doing better.’ So we definitely knew we were a business then. And over the years, like any socially conscious corporation, the band has reached into its pockets in the spirit of philanthropy. They’ve raised more than $650,000 to support high school band programs in Georgia through the Tunes for Tots program, raised about $2 million to fight Spinal Muscular Atrophy (the Hannah’s Buddies program, Bell’s pet project inspired by his god-daughter’s battle with the disease); and the band has given generously to the post-Katrina rebuilding effort. Even the band’s unofficial stakeholders, the Spreadheads, are involved, holding food drives at Panic concerts and creating The House the Widespread Panic Fans Built in New Orleans’ Lower 9th Ward. The Panic universe is spreading the love. Before much of this could happen, though, the band had to go through its toughest trial yet, hitting a critical crossroads eight years ago when Michael Houser – Mikey, the beloved lead guitarist – lost his battle with pancreatic cancer. Houser, nicknamed ‘Panic’ for the panic attacks he used to have, was a string artist who’d sit in a chair on stage, face shrouded by his long hair, and work magic up and down the neck. He left behind a wife and children among his many mourners. When it came time to settle his affairs and stay home, Houser gave the band his blessing to keep playing. Bell says, “We knew we’d never be the same without Mikey. But we had these other individuals and their families in our business, the Widespread Panic business – a lot of friends and livelihoods to consider. The band fulfilled its obligations through 2003, touring with several other guitarists, including longtime producer and friend John Keane, then announced it was taking 2004 off. The band hit the road hard in 2005 with George McConnell on lead guitar. When he left the band in August 2006, Herring was offered the job. He’d sat in with Panic before, played on the same card plenty of times. First he had to finish a tour with his own band, then had two weeks to learn about 300 songs, then played his first Widespread Panic gig as lead guitarist at a sold-out Radio City Music Hall. Instead, he lives near Nashville. Schools lives in California, Herring lives in Buford, Bell lives in the northeast Georgia mountains. Only Nance and Ortiz still live in the Athens area. They all rely on Sam Lanier, who has been managing Panic since 1987, and co-manager/agent Buck Williams (who has represented R.E.M. for 30 years, and has been with Panic since 1991) to run the business. And the more dates they can do back to back in one arena, the better. The road to those three-night gigs was paved in part by friends and fans like Bill Cochran and Horace Moore (now the band’s official archivist), who taped the shows, often making copies, often sending them to friends in other cities. It might mean 10 more people coming through the door, which was a big deal then, says Bell. “For us the taping was huge. It was a no-brainer. We always recognized it as a positive thing. No one in the music industry, Dave Schools says, is made fun of more than “the evil record company guy. It’s a cliché for a reason. This is a highly exploitive business, the books are cooked in many cases and the artists are supposed to feel lucky to do what they do. So they didn’t get the MTV, they didn’t get the Top 40 airplay. They got the gigs, though, and the miles will be paying off for years. In addition to a warehouse full of merchandise, Panic has shelves of boxes filled with old recordings and has enlisted Moore to spin those into an archive series of CDs. So the business plan evolves a little more – these are quality recordings, made by the band. They’re selling fast, these archive recordings, but it hasn’t changed Panic’s attitude. Tapers may still tape. Why kill a good thing? “The tapes made it across the Mississippi long before the band ever did,” says Schools, who is sitting at a picnic table a few feet from the watchful Yeager near the backstage door. Schools looks at Cochran, says, “Well, thank you.” And he really means it.